Most of the equipment used in the industry and particularly in the nuclear activity, need to be vacuum or pressure tight for operative and safety requirements. These devices have to satisfy particular regulations in order to be qualified by means of operating licenses. One of the most efficient systems to ensure leaktightness is using a helium leak detector with a mass spectrometer. In this paper we show the equipment and the devices employed in fuel bars fabrication for CAREM project, and some typical material defects. Operating system and the sensitive of this method is also described. Tasks performed with fissile materials require the use of highly reliable equipment in its airtightness characteristics. the highly precise technique of helium or argon losses detection. The sensitivity of the helium loss method is justified taking into account the established rules to verify the airtightness of glove boxes and combustible bars, among other elements. In order to quantify the admitted losses magnitude in some containers, it is convenient to consider that French and English norms establish growing airtightness degrees, to the point of requiring an admitted loss rank of 0.03% of the confined volume per hour for the kind of glove boxes built in CNEA for plutonium (d category). 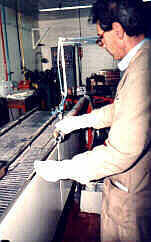 IRAM norms, which flux parameters established by DIN norms, require severe airtightness conditions for these equipments. They establish very low losses rate per period of time, in very strict pressure and temperature conditions into the glove boxes test environs. Although mentioned foreign norms recommend the use of oxygen analyzers those compare the volumetric titration in that gas, both before and after the airtightness experience period. 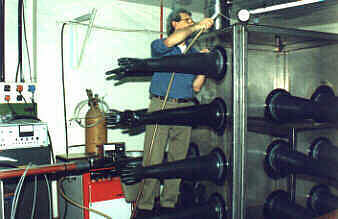 Tests performed to license contained glove boxes (Fig. 1 and 2) showed the measuring of the confined atmosphere with high sensitivity instruments as the most practical and efficient method, watching possible losses with a helium detector equipment, given the admitted loss amounts derived from the technical requirements mentioned above. In the photograph (Fig. 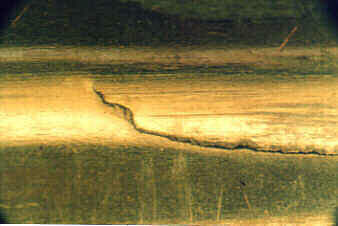 3) a typical failure in a zircaloy cladding can be observed, that shows itself as a longitudinal cut of the wall. A helium loss was detected working with the spectrometer in the 10-7 mbar.l/sec; minimum recommended sensitivity in these cases. It must be taken into account that test is performed at room temperature, being highly possible that loss amounts will increase, given the working conditions of the combustible bar due to dilatation originated in reactor's temperature. Many airtightness tests performed show that to ensure a good atmosphere confinement, the loss test of the equipment to be examined must be conducted in pressure and vacuum conditions, because several components and accessories may allow the passage of gas in one direction and not in the other. The detection equipment allows the double function of creating vacuum into the receptacle measuring the gas passage from the exterior, and also of detecting the gas exit under a higher than the atmospheric pressure from the interior through a sampling probe. Experiences performed to control equipment that requires very high degrees of airtightness have advised the use of calibrated losses to guarantee the exactitude and precision of losses measurement. There are capsules with known leak capillaries through which gas flows and others bearing helium in its interior. These calibrated losses are not only used to control the detectors' operation but also allow checking the response timing in extended systems and estimating real losses ranges, as opposed to virtual ones. These factors can be applied to deduct confined gas loss when determination of loss has been made, using another test gas. It can be assumed that there is molecular flux in losses of less than 10-8 mbar.l/sec. Leaks larger than 10-4 mbar.l/sec should be considered as laminar flux and for intermediate values intermediate flux factors should be applied between both types of flux. There is no such thing as absolutely airtight equipment and in principle there is no need for this condition. What is important is that the leak rate be comparatively small and that it does not represent an influence on the required working pressure, neither on the confined gas contents nor in the receptacle final pressure. In can be then stated that the airtightness condition of the equipment must be the minimum necessary required by the established work pressure. The leaks rate is defined as the amount of gas that flows towards the inside of a vacuum system through one or several losses per time unit. 1mbar.l.sec.-1=1cm3.sec-1 (NTP). NTP meaning normal 0°C temperature and normal 1013 mbar pressure. Highly airtight equipment: total leak smaller than 10-6mbar.l.sec-1. Acceptably airtight equipment: total leaks approximately 10-5mbar.l.sec-1. Non-airtight equipment: total leak larger than 10-4mbar.l.sec-1. Highly airtight equipment: total leak smaller than 10-4mbar.l.sec-1. Acceptably airtight equipment: total leaks approximately 10-3mbar.l.sec-1. Non-airtight equipment: total leak larger than 10-2mbar.l.sec-1. Before resorting to the helium leaks proof, which sensitivity is naturally very high, it is possible to detect large losses using ionization or thermal conductivity instruments. Due to the fact that the choice of instruments depends on the type of gas being used, a fast test can be performed in areas where losses are suspected covering the zone with acetone or alcohol, which will make the instruments vary their readings on detection. The levels of sensitivity of this method are not very high. It is important to have present that the pressure detected in an equipment where vacuum has been created has an influence both on the gas penetrating from the exterior and on the one coming out from the walls of the container of the receptacle, the sealing materials or other elements belonging to it. When testing an equipment it is necessary to carefully distinguish leaks originated in openings that allow air to come from the exterior, called real leaks, from the apparently detected due to the evolution of confined air in the interior, called virtual losses. When creating vacuum in a system, lack of airtightness from air penetrating from the exterior is detected by a constant range pressure increase, while the air flux evolving due to other reasons diminishes along time. In diagram in Fig. 4, it is shown the way pressure increases in presence of a real leak, the way it does due to virtual leak and the resulting effects in both cases. A factor to be considered in high vacuum essays is gases permeability in the component materials of the system. The kind of synthetic rubber tightening elements are made of (e.g. perbunan, neoprene, viton) has a permeability of 5.10-8 to 20.10-8cm/sec (NTP) for a 1 cm thick and a 1 cm2 surface material. This value is just approximate due to variations related to its chemical composition and the compression the part is subject to. The silicone rubber of identical dimensions has a permeability of 250.10-8 cm3/sec (NTP). Metals are practically impermeable to helium. Before using the helium leaks detection method it is convenient to perform an airtightness test measuring losses due to pressure increases with the appropriate instruments. 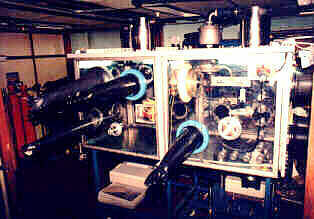 To perform reliable tests two measurement points in the system must be checked. In Fig. 5 an installation with two manometers placed in the best position is displayed. It is advisable to measure the pressure loss through a compression manometer (Mc Lead). When using a total pressure manometer (Thermotron or Thermovac) the gauge head must be connected to a nitrogen or liquid air trap in order to avoid .the detection of both, real and virtual leaks. It must be taken into account that the outgassing effect is due to the presence of condensable gases. According to Fig.5, scheme, all system valves should be closed (4, 6 and 7) measuring the pressure value and the reading time in manometer 2. Measurement will be repeated in regular intervals that will depend on contained volume and airtightness of measured system. where V = volume in liters. Dp = p2-p1 = pressure difference in taken period of time. Dt = time difference in seconds. Operation will be repeated until results are satisfactory, continuing with the vacuum pump operation until all virtual losses are eliminated. 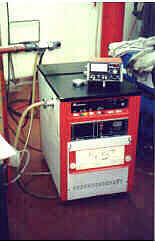 For the detection of helium leaks, the equipment Leybold-Heraeus shown in Fig.6, has been used. The device used to test fuel rods and cobalt capsules is also shown in fig. 7-8 and 9 respectively. From experience gathered about equipment and appliances behavior in working conditions, it can be concluded that the method of lakes detection chosen is highly dependable and practical. Fuel rods, for nuclear power plant, are controlled by this method and a great experience exists in this field. However it can be applied in efficient way to another special devices, which have different sizes and shapes. In glove boxes test, working with lake amounts of around 10-8 mbar.l / sec. and cobalt capsules with lake 0,90-1,0 mPa.m3/sec. the methods ensure fulfillment of required norms. Experience attained makes possible a more detailed analysis of the use of this method for tests in large volume equipment and in devices made of dissimilar materials.